AGLAONEMA: Aglaonema ‘Silver Queen’, Cold Damage and Spring! Spring may be just around the corner but depending on the plant variety - “cold” can still be an issue. One of the most popular and commonly grown Agloanmeas is the variety called ‘Silver Queen. Silver Queen’ does not handle the cool temperatures like many of the new varieties. Here’s a pictire of two leaves of Aglaonema ‘Silver Queen’ - you’ll notice the leaf on looks very much different than the one on the right!. 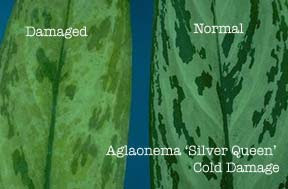 The ‘chinese evergreen’ on the left shows the injury that commonly occurs during the winter months when “Silver Queen’ faces temperatures in the 55-60 degree range for periods of time! Don’t forget to watch the temperatures your plants receive even during the spring. Remember - they can’t throw on a sweater to stop the chill!